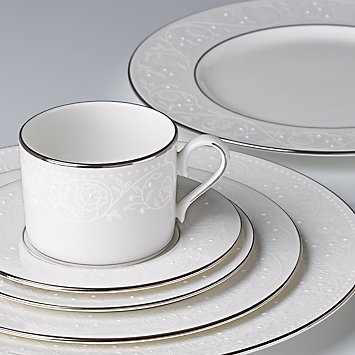 The Floral Veil 5-piece Place Setting features a raised floral design peppered with enamel dots giving this dinnerware its romantic look. The white-on-white motif is framed by rims of precious platinum. Diameter of dinner plate: 10 7/8", salad plate: 6 3/5", bread plate: 6 1/4", saucer: 5 3/4"; height of cup: 2 3/8", capacity: 8 oz.